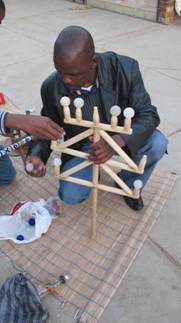 In 2010 the Africa meets Africa Project and our sponsor Plascon Paints won the BASA (Business and Arts South Africa) award for Increasing Access to the Arts. The AmA project titled Ndebele women painting in the city had facilitated much awareness of rural arts in the city through a large mural Esther Mahlangu, Esther Mnguni, Betty Mtau and Francinah Ndemande painted on the façade of Sci-Bono Discovery Centre in Newtown, Johannesburg, when we launched the teacher's resource Africa meets Africa: Ndebele Women designing Identity there in 2009. AmA mathematics writer Jackie Scheiber presented teacher's workshops with the mathematical ideas displayed in the four artists' work - it was easy, for example, to identify the Theorem of Pythagoras in Francien Ndemande's designs in the mural!. 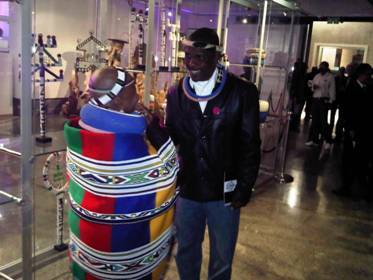 In 2012 Africa meets Africa again facilitated the celebration of Ndebele art in the city, at the 15th Annual Business Day BASA Awards ceremony, held this time at the new Wits Art Museum (WAM). 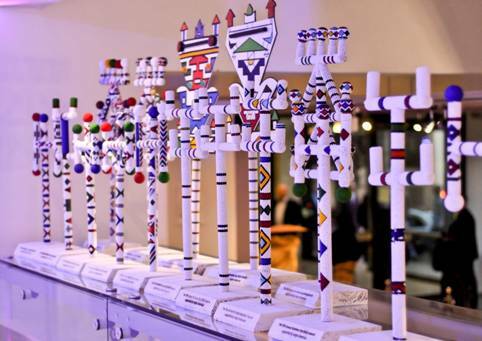 The twenty 2012 BASA awards (lined up in the photograph below) were made by master beadwork maker Sophie Mahlangu and long-term AmA collaborator Petrus Mahlangu. Above left: Sophie and Petrus Mahlangu chatting just before the BASA award ceremony at WAM. In the display case behind them the WAM collection of traditional dancing sticks or Iintelefomu are displayed. Above left they appear in Sophie's shop in Mobhoko village in the Nkangala district of Mpumalanga Their twenty individual awards, each between half and a full metre high, were a contemporary interpretation of the traditional Itelefoni form. The idea of reviving the Itelefoni form was conceived by Julia Charlton, Senior Curator of WAM. This form of dancing staff or stick surfaced during the era when electrification had not yet reached much of rural South Africa and was coveted by women who worked in places where electricity (and telephone) poles were a common sight. So desirable was the idea of electric light, that Ndebele women began incorporating the shapes of electric lamps into the traditional geometric wall paintings they made on the front walls of their homes. 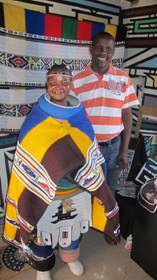 The Ndebele aesthetic, passed down from mother to daughter for generations was made world famous by well-known artist Esther Mahlangu, who exhibits her interpretation of Ndebele art on canvas in galleries across the globe. 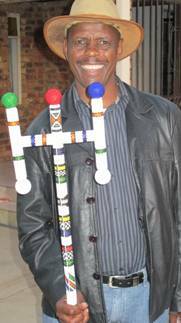 In time, as electrification reached areas outside towns and cities, the Itelefoni dancing staff became less of a feature of Ndebele traditional life, with simpler shapes replacing its ornate form in contemporary staffs. 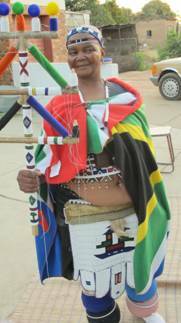 But since Sophie and Petrus Mahlangu began preparing the awards given to the 2012 BASA winners, in rural Mpumalanga memories have been surfacing of the way Ndebele women would ceremonially dance with their ornate Intelefoni in hand, upon the completion of their sons' initiation rites (ukuwela). What would a contemporary equivalent be one wonders - a cell phone tower?